The beers pours the darkest red I have ever seen; its has a deep ruby color that appears to let light in but not escape. It has a nice off-white head with great retention and leaves a considerable amount of lace. The aroma is heavily of roasted malts, hops, some tart fruits and lots of dough/ bread. The flavor is very sweet and bitter; hops, tons of barley, biscuits, and fruits (berry fruits). It has a great start and finishes with a noticeable amount of alcohol burn. Leaves your mouth dry initially but the flavor last for a long time afterwards. Man I scored one of these for the first time way back in the day when I was in Yakima, WA for the fresh hop festival. Its mostly a mixture of the colors brown, dark red and some black. Thin head, beige in color, 1/5". Aroma was roast and booze. Seems almost like a black barleywine, like a mix of a stout and barleywine. The best black and tan there is. Dark fruit, roast, toffee, caramel, booziness, mild citrus hop quality to it. Actually a lot more dark fruit than I would expect in the mouth feel. A new barleywine from Southern Tier??? I've been pretty impressed with their big beers since they became available here so I had to try it. Here goes. 22 Ounce bomber bottle poured into a snifter glass. A - Very nice look. A dark mahogany that glows a bright red when held up to light. Two finger head of cream colored foam, probably due to hard pour. Head has some staying power. S - Hops coming up here along with some sugary smell. T - A whole lot of fruity/sweet malt flavors here. This brew really has the flavors of an English Barleywine. The alcohol is well hidden in the taste. Lots of sweetness. M - A nice chewy, thick sticky feel. D - I found the sugary flavors to be a bit overdone. Still pretty good if you're looking for a really sweet barleywine. Notes: This one's gotta be mislabeled. It's an American brew but it's got the characterstics of an English BW. Still quite tasty. A - Dark mahogany, ruby with a thin tan head and sticky lacing. S - Spicy, citrus, piney and perfumey hops with sweet caramel, toffee and dried dark fruits. T - Big citrus, spicy, piney hops followed by sweet caramel, toffee, cherries, raisins and prunes. Slight alcohol taste is noticeable but fits nicely. M - Creamy and not as thick as other barleywines. Dry bitter finish. D - A nice blend of bold hops and sweet malts. Perhaps it's hard for me to get excited by a beer in this category that costs more than Bigfoot but delivers less of the pleasure. 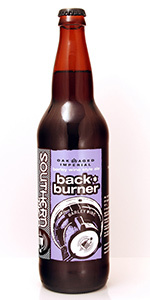 What we have here is a year aged bottle of backburner. Thick viscous dark copper colored with unfiltered characteristics. A one finger head of tan fades quickly into some trace laceing and a puffy topping. Spicy hoppy aromas up front. Some dark homeade caramel and toffee mixed with dried fruts underneath. The hops show a little bit of flora citrus as well. Not huge on the style (of the nose) for a barley wine. Very interesting barley wine. Dried fruits become juicy and tight in the mouth. Fig, date and prun with dark caramel. Very bitter ending spicey and complex totally dries out the tongue. Some apple flavors on the late mid palate to finish with a bit of a nutty kick. Nice creamy mouthfeel but the overly bitter finish hurts drinkability. But a good BW nonetheless. Courtesy of RB's own GMCC2181 via sweet trade bonus, thanks Gabe. Pours clear crisp amber with thin tan head. The aroma is musty dark fruity esters, some pine and grassy hops followed by a note of alcohol heat. The taste actually feels a bit thin to start flowing into notes of prunes, raisins, followed by pine and grassy hop bitterness. Some moderate alcohol rises up toward the finish as a tasty roasted malt note brings this to closure. Feels like more age might help this some. From tasting notes. L: A dark, slightly hazy pour supports a clingy 2” cream colored white foam collar. S: Wine and fruit aromas. T: A big malty palate with toffee, large pitted fruit, cola, and a long, lingering bitter hop finish. F: Full body, soft palate, medium carbonation. Has a wine like warming. O: A big, well balanced beer. A-Pours a dark, hazy copper color with a one finger off white head that has fair retention but leaves some nice lacing. S-Bready malt, a bit fruity and spicy, hops present but are on the "backburner" here. T-Follows the nose with the bready malt, a bit of fruit and spice, pine & citrus hops and a hint of booze. Its good. M-Medium body, a bit oily and slick. Coats the palate. D-For a big beer, its surprisingly smooth and easy to drink. A very good and respectable entry in the category. I enjoyed it a lot and will certainly be picking up a few more bottles-some for immediate consumption and some for aging. D - The 10% ABV is really well hidden on this one in the taste but you will start to notice it after a while...I was surprised at the amount of hops still left after a year...I wonder what a fresh bottle would taste like? A murky super dark copper with some stick lacing. Clear and dark, really pretty in a goblet. Smell is pretty strong fruits, yet lots of hops balance it really well. Taste is sweet and strong and clear. More balanced toward the malts than some aggressively hopped barleywines. I imagine if this is left to age and mellow the hops it will be really nice. As it is it is very fruity, raisins, dates and some caramel thrown in. This is most everything a good barleywine should be, I think it leans more toward the English barleywine than American. A few years in the bottle would really let that come out. A real sipper, very nice to drink and very easy going down. Visited the family in Connecticut today and came back with a sweet haul, including this fine offering from Southern Tier, courtesy of my brother Matt. Nasdrovia Bro! A - Reddish brown and clear, barely any head to speak of, but this is fine for a barleywine. S - Grainy, toasty, with pleasant fruity esters. The hops are there, but seem to be performing the difficult task of masking the alcohol in this huge brew rather than being up front and in your face as you would find in a Bigfoot. T - Toffee, caramel flavors dominate, with a nice dark fruit finish. Dried apricots, raisins, and sweet malts with the slightest hint of citrusy hops. The hops were probably more prevalent before aging, but time has given this a wonderful balance. Mellow malty, fruity flavor at the onset, with a mild citrus hop finish that lingers nicely on the back of the tongue. M - Thick, smooth and chewy with a wonderful warming quality. Perhaps the best aspect of this deceptively mellow brew. Like butter on bread (which isn't to say diacetyl--it's just so smooth). Really dark red with an off-white head that has excellent retention and lacing. Sweet caramel, dark fruits, and toffee are balanced with piney and orange-y hops in the nose. Sweet malt all over the tongue; caramel, dark fruit, and a large amount of bitter, but flavorful hops come through with some pineapple and tangerine. This drinks incredibly smooth to me with a full body and about medium carbonation. I'll be getting more of this.